If you're a cop, Facebook can be a minefield. It's not a good idea to sound off about the sergeant or hash over confidential investigative techniques with your buddies — and 1.2 billion other users. But what if there were a Facebook just for cops? It turns out there is. 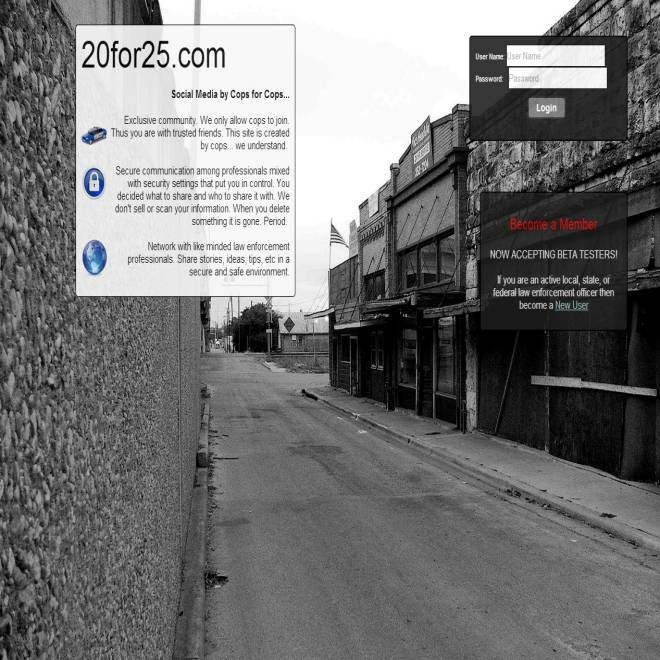 20for25.com launched two weeks ago as a closed, secure social media site "for cops by cops." "Law enforcement professionals need a place to network, share training ideas, and socialize in a medium that is safe and secure," the new site said in an announcement of its launch Aug. 19. So before law enforcement officers can complete registration, 20for25 ("10-20" is standard police code for a location report, and "10-25" is a request to meet in person) verifies their credentials with their employing agency. 20for25 isn't alone in the market. In October, former New York Police Commissioner Bill Bratton will launch BlueLine, " the secure professional network built exclusively for law enforcement." "At a time when the growing global market for social networking solutions is transforming corporations, the public safety community — individuals with perhaps the greatest need for real-time collaboration — has been left behind with analog tools," BlueLine's parent company, Bratton Technologies, says in its funding pitch through AngelList, the Silicon Valley startup incubator that has nurtured such successes as Uber, Voxer, 500px and Disqus. BlueLine is less like Facebook than 20for25 is. It'll also provide mechanisms for the thousands of U.S. law enforcement agencies to collaborate in real time, as well as a private marketplace to buy and sell equipment. 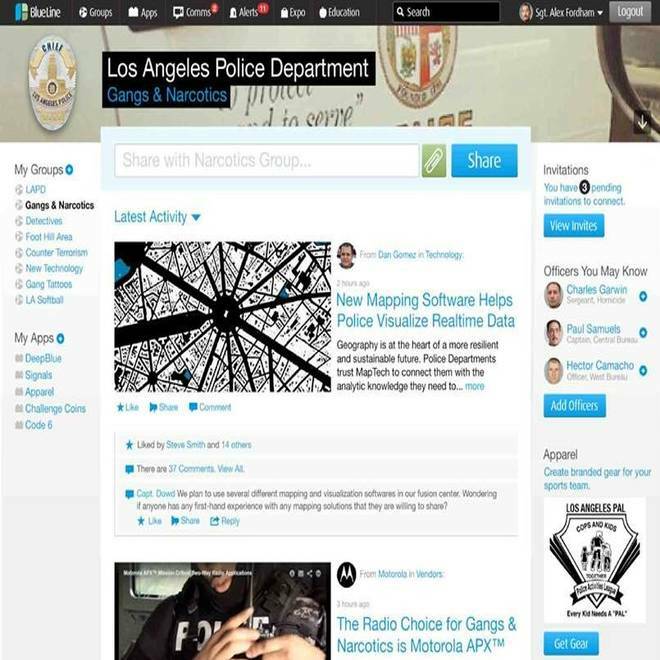 BlueLine, a closed social network for law enforcement and security officers, has been in beta testing at the Los Angeles Police Department and other agencies since July and will launch in October at the International Association of Chiefs of Police conference in Philadelphia. Public safety officers are, by definition, public employees, answerable to the public. So why do they need a private network at all, let alone two? After all, neither site is, or can be, completely private. Not yet having publicly launched, BlueLine doesn't have a specific policy posted. Bratton Technologies, its parent company, has a similar policy, saying it will never share information without permission — except "when we believe release is appropriate to comply with the law or to protect the rights, property, or safety of Bratton Technologies, our users, or others. The real selling point is safety. "The power of the Internet — social media in particular — has brought danger home to officers and their families," the FBI warned in a report in November. "They cannot shield themselves as easily from the repercussions of their jobs defending the community." "In the past, police could to some extent protect themselves and their loved ones from threats," it said in the November issue of the FBI Law Enforcement Bulletin. But "with increased exposure of personal information through social media, preventing these antagonists from crossing the line that separates officers' professional and personal lives is difficult," it said. BlueLine will launch in Philadelphia in October at the annual conference of the International Associations of Chiefs of Police, which has invested heavily in law enforcement-related social media education and advocacy. The IACP Center for Social Media is devoted primarily to helping agencies use social media to reach out to the public, but it also notes scenarios in which social media can bite back. Public posts commenting on active cases can jeopardize investigations and even end up as grounds for successful appeals, it warns, and criminals have been documented using photos that officers have posted online to track them down. "Postings by officers and other emergency responders continue to make headlines nationwide and very publicly cast doubt on those officers and their abilities to make good judgments," Boise, Idaho, Police Chief Michael Masterson reports in the current issue of the IACP's magazine, The Police Chief. Cops will always vent, Masterson writes, but "a passing thought or a gripe posted on Twitter or Facebook is not kept among friends; it could essentially be available to the entire social networking universe." "New technologies are presenting new challenges for officer safety in a huge variety of ways, and those technologies are developing at a frantic and almost overwhelming pace," he said.